Friday 30th march and we arrive at Limassol. It is the most clear morning beautiful sky's but at a cost. The temperature has dropped to around 16 which after the weather we have had seems cold. No great objectives for today just have a look around to see what the old town is like. Well the town is typically Greek narrow winding streets with those familiar Greek tavernas. There we stopped and took on board a leisurely lunch with local beer. I was thinking of days gone by and of Karen and Pete who would have enjoyed it so much, maybe we can lunch together in the near future. Following the lunch a stroll along the promenade and some browsing of the local fare. This is primarily lace and leather goods. Back on board by 5 pm, again as per the rest of the cruise the days ashore are too short but we make the most of them. Today we spent the day with Barbara and Frank. Some people took taxis into the hills where believe it or not there was deep snow, we fancied an easy day as we are off to Bethlehem tomorrow and it's a long day. When we returned to the ship preparation started for the world cruise fancy dress party. Wendy was dressed as a Muslim woman complete with veil and all in black, her outfit was very good and attracted many comments from fellow passengers and staff alike. Barbra dressed as a Vietnamese woman in a lovely gown. 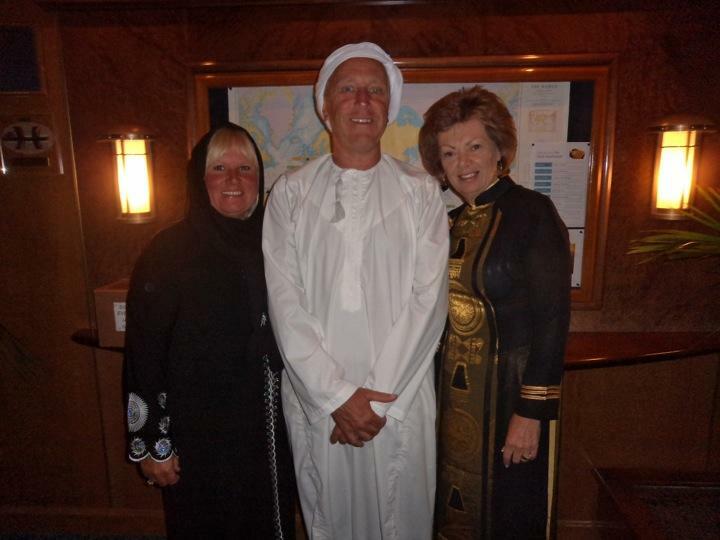 I went as an Arab with a white dis dash and modest head dress. the photos will give you some idea. Frank went as an Englishman wearing a union jack tie as he overlooked getting any outfit! Upon our arrival in the bar imagine our dismay when we discovered out of 1950 passengers about 30 were in fancy dress. Still we had entered into the spirit of it all and the shame, if any, was on those that turned up to watch but carefully did not partake. It is also down to the entertainment team who should have encouraged a higher profile for it and greater levels of participation. A few beers soothed away the strange noise coming from the stage. It was like a church organist playing 1960 pop songs, pretty frightening really. Then it was off to bed for the early start in Israel tomorrow.